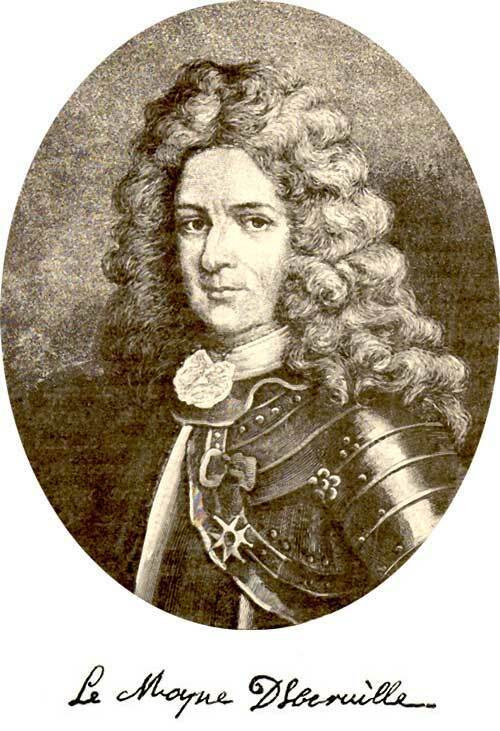 French forces were to depart from Placentia for the eastern Avalon, one under Pierre Le Moyne d'Iberville by land, and a second force, by sea, under the Governor of Terre-Neuve, Jacques-François de Brouillan. From Justin Winsor, ed., Narrative and Critical History of	America: The English and French in North America 1689-1763, Vol. V (Boston: Houghton, Mifflin & Company, 1887) 15. De Brouillan's force of seven ships, a number of smaller vessels and some 700 men were assembled at Placentia before d'Iberville's march was ready to commence. De Brouillan, perhaps tired of the delay and with an eye to the booty to be taken from the English settlers, set out in September for the English Shore. 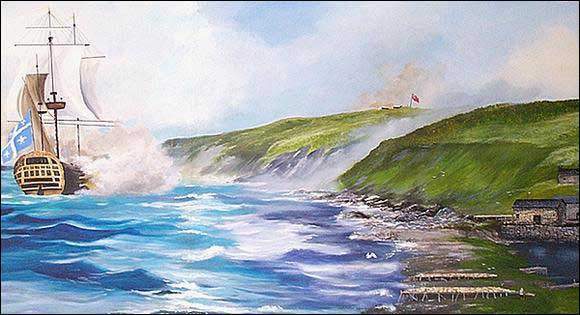 De Brouillan attacked Bay Bulls, burned five small forts and caused the English there to burn a frigate, the Sapphire, and retreat to Ferryland. The Sapphire was a 32 gun, 5th rate frigate, in Newfoundland to protect the English migratory fishery. The vessel was trapped in Bay Bulls harbour by four French naval vessels led by Jacques-François de Brouillan. In order to avoid capture, the English scuttled the vessel in 60 feet of water on September 11, 1696. The nocturnal was excavated in 1977 by Parks Canada. Courtesy of the Department of Canadian Heritage, Parks Canada, Federal Archaeology. ©Her Majesty the Queen in Right of Canada. Reproduced with the permission of the Minister of Public Works and Government Services, Canada. On Monday, September 21, 1696, French troops landed at Ferryland and quickly overwhelmed the settlement. At the time of the attack, d'Iberville was exploring the upper reaches of Placentia Bay, looking for the best overland route to the English shore. 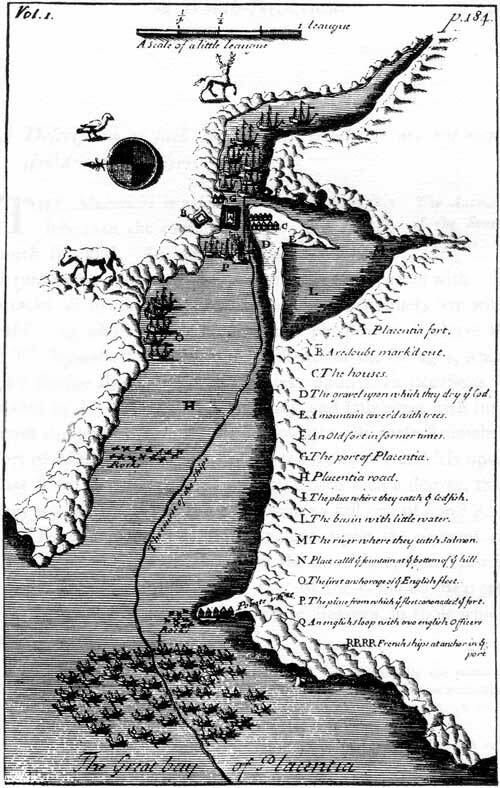 The French looted and burned the entire settlement and sent most of the inhabitants to spend a destitute winter in Barnstaple and, later, in Appledore in the English West Country. Despite their situation, the settlers returned to the West Country may have been the lucky ones. Captives that the French hoped to ransom were imprisoned at Placentia. When the French attacked Avalon in 1696 they took the three Kirke brothers captive and were probably hoping to ransom them. David Jr., Philip and George Kirke were imprisoned at Placentia, where two of them died. The third brother died a short time later in St. John's. B. A redoubt mark'd out. D. The gravel upon which they dry ye Cod. E. A mountain cover'd with trees. F. An old fort in former times. G. The port of Placentia. I. The place where they catch ye Codfish. L. The basin with little water. M. The river where they catch Salmon. N. The place calld ye fountain at ye bottom of ye hill. O. The first anchorage of ye English fleet. P. The place from ye fleet carronade ye fort. Q. An English sloop with two English officers. RRRR. French ships at anchor in ye port. From Baron de Lahontan, New Voyages to North America Chicago: A. C. McClurg & Co., 1905) 345. Reprinted from the 1703 English edition, includes facsimile of original 1703 map. Original housed in the National Archives of Canada, Ottawa, Ontario. Text information partially based upon Jean-Pierre Proulx, The military history of Placentia: a study of the French fortifications; Placentia: 1713-1811, History and Archaeology Series, vol. 26 (Ottawa, Ontario: National Historic Parks and Sites Branch, Parks Canada, Environment Canada, ©1979) 98. David Kirke, Jr., and one of his brothers died at Placentia; the third surviving son of Sir David and Lady Sara Kirke died at St. John's a short time later, clearly a result of his imprisonment. The settlers deported to Barnstaple and Appledore returned to Ferryland and reestablished the settlement the following spring. The winter of 1696-97 is the only period since August 1621 when Ferryland was not occupied by Europeans. 1. Baudoin, Jean. '[Abbi] Jean Baudoin; 10 November, 1696 to 19 November, 1696: Extracts from 'Journal du voyage que j'ay fait avec M. d'Iberville, Capitaine de Frigate de France en l'acadie en l'isle de terre-neuve' [Journal of the Voyage that I made with M. d'Iberville, Captain of a French Frigate, to Acadia to the Island of Newfoundland]'. Original is an unidentified alternate version of France, Archives des Colonies, AC Clld, vol. 3, f. 170. The latter is on microfilm at National Archives of Canada. Published in Alan F. Williams, Father Baudoin's War: D'Iberville's Campaigns in Acadia and Newfoundland 1696, 1697, edited by Alan G. Macpherson (St. John's: Memorial University of Newfoundland, Â©1987) 50, 173-191. Translated by P.E. Pope.